Kick off 2018 by saving on fitness supplements to help you hit your resolutions, cookware to make your kitchen more enjoyable and productive, and extremely soft underwear that you’ll enjoy all year ‘round. Anker’s original SoundBuds are your favorite affordable wireless earbuds, but the newer SoundBuds Tag just got their biggest discount ever. $18 is $12 less than usual, and the best price we’ve ever seen. You should probably own a hammer drill and impact driver anyway, so if you don’t already own them, you can pick a FREE bare tool of your choice when you buy this combo kit for $294 today. Just be sure that both the combo kit and the bare tool you select are shipped and sold by Amazon directly. 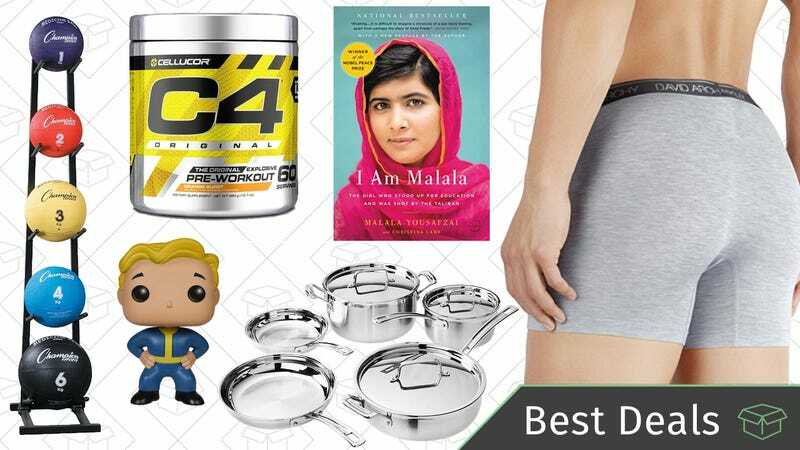 We made it to another year, which means Amazon is going to spend the next few weeks trying to sell us all fitness-related stuff to help with those New Year’s Resolutions. Today, they’re kicking off 2018 with a solid sale on supplements from a variety of manufacturers. In addition to the discounted prices, some options also have extra coupons available when you use Subscribe & Save. For example, this tub of C4 pre-workout powder basically always costs $50 on Amazon, but that’s knocked down to $35 today, $33 with Subscribe & Save, or just $24 when you clip the included 30% coupon on the page. That’s just one example of the great deals here, so I’d stock up. Update: This sale ends January 2, so get your orders in now. Note: This deal ends today, so get your orders in now. I’m pretty sure I could spend every day of the next three months in long johns, and with this 30% off Amazon coupon, I could probably afford to. Choose from multiple sizes and colors, all for about $8 at checkout. You can better yourself with today’s Kindle sale, full of classic books (like The Lord of the Rings and The Odyssey), books about world changers (like I Am Malala), and a book about a cat that pees on things. So you’ll be sure to find something you’ll love, all $5 or less. This sale only lasts through the end of the day, so what are you waiting for? Amazon’s waving its discount wand on the Harry Potter franchise, with all eight Hogwarts-centric films on sale for just $7 digitally.